You know those little white shorts made for the tennis court? You can't wear those to work. You can, however, wear these Wrangler Workwear Men's Black WP90 BK Canvas Cargo Work Shorts on the job. They’re made for it. Once you give these longer, work-ready Wra ... (see full details) (see specifications) #WRGWP90BK. You know those little white shorts made for the tennis court? You can't wear those to work. 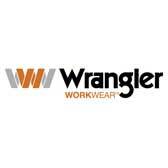 You can, however, wear these Wrangler Workwear Men's Black WP90 BK Canvas Cargo Work Shorts on the job. They’re made for it. Once you give these longer, work-ready Wrangler shorts a try, we don't think you'll settle for anything else. They're styled with a 12-inch inseam that's long enough to provide coverage, even when you're bending, squatting, and moving around. And speaking of moving, the full-inseam gusset adds extra fabric to help provide unrestricted movement on the job. A tough canvas weave in a 7.5-ounce blend of 60% cotton and 40% polyester makes these men's shorts both comfortable and tough. Cotton is soft and breathable for heat-releasing comfort, and polyester adds lightweight durability that resists wear. Machine washable at home or in an industrial wash, light soil, these short pants are made for easy care. Double-needle stitching was used throughout to construct these short work pants. That means the strength of two threads, not one, keeps every line of the design strong. They'll keep their good looks, thanks to their color-retention, soil-release, wrinkle-resistant finish. Styled with a lower rise than traditional work pants, these canvas shorts fit comfortably. Darts above the back pockets help provide a better fit. The wider and longer belt loops accommodate many different sizes of belts. As practical as they are comfortable and durable, these men's cargos have plenty of storage spots. Two slacks-style front pockets are a generous 13 inches deep and are reinforced for long wear. The back pockets are set in for a smooth, professional look, and there's a button on the left. Patch cargo pockets on each leg feature roomy bellows styling plus exterior utility pockets that close with snaps. Hang on to those tennis clothes for court time And for workday comfort, easy-care, durability, and plenty of pockets, reach for these Wrangler Workwear Men's Black BK Canvas Cargo Work Shorts. Yours are waiting at Working Person's Store -- order today! I have been looking for a pair of comfortable pair of shorts with cargo pockets but did not want all the frills of expensive versions. These fit the bill for me: long enough in the leg to feel comfortable when I sit and ample room to bend and squat. They also wash well without getting all crinkled up. Wrangler Workwear Shorts: Men's Black WP90 BK Canvas Cargo Work Shorts is being added to your cart.